There’s nothing worse than having a battle with your child twice a day over brushing and flossing their teeth! You’re thinking to yourself – “There must be a better way,” and there is. 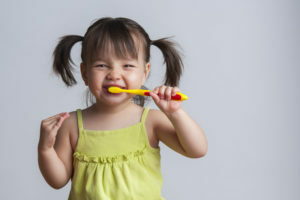 Your family dentist in Toledo has some tips on how to make brushing fun for your child. Perhaps, they’ll even look forward to it! There are so many fun toothbrushes and different colors and flavors of toothpaste for children. Allow them to pick out their favorite brush. Maybe it sings, or has their favorite character on it. Let them choose their own toothpaste, delicious flavors such as bubblegum or strawberry might motivate them to brush. If they see you brushing and flossing your teeth, they may be more apt to follow suit. You can even let them brush your teeth in exchange for you brushing theirs. Make it fun for them. Help your child brush for the recommended two minutes per day by making a game out of it. Use a timer set for two minutes to see if they can get their teeth clean in time. Download fun apps that play music while they brush. Create a chart for them to keep track of their brushing and flossing success. Using a little creativity can go a long way in relieving your daily brushing woes. Consider offering them a sticker or small reward for brushing for the full two minutes or cooperating. You might be surprised at how motivating a reward can be. Regular visits to your dentist in Toledo will also help your child feel more comfortable about brushing at home. At Dental Group West, we recommend that you bring your child in for their first visit right around their first birthday. This may seem early, but it helps them acclimate to our office and allows us to examine their teeth and oral development. As your child gets older, we’ll educate them about their oral health and the importance of brushing and flossing at home. We’ll even show them the proper techniques to use to make the most of their home care. We may also recommend fluoride treatments or dental sealants to help strengthen and protect their teeth. If you’d like to learn more about making brushing fun, or if it’s time to schedule your child’s next appointment, give your team at Dental Group West a call today. We’re happy to help!